39 grey cast resin parts, 2 small sheets decals, and instructions. 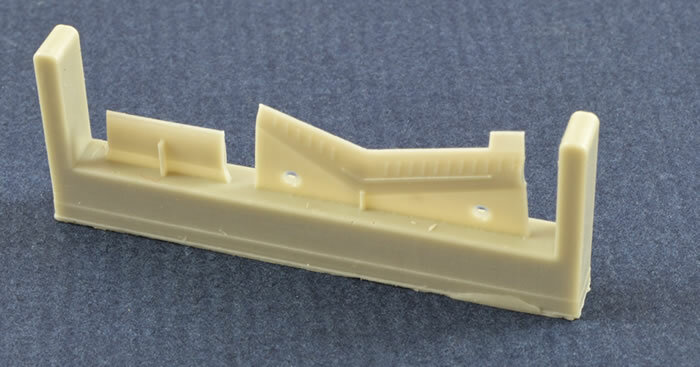 Clean, moulding with great detail, no canopy and one colour all over. It’s an all resin kit. Some would think this is a disadvantage. Also lots of very small pieces. Confusing decal sheets with no instructions. A great subject with some really good detail of the US Navy drone. 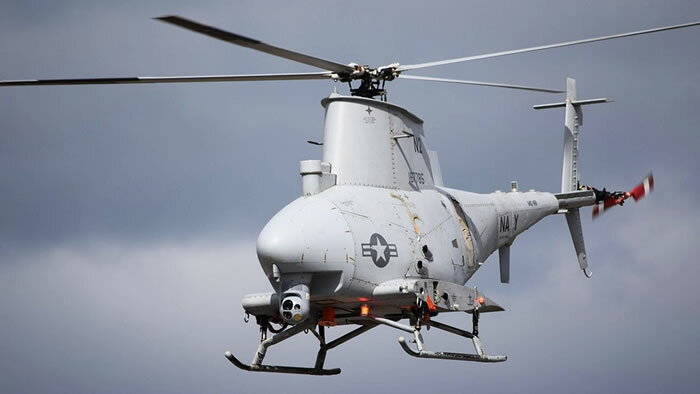 The Northrop Grumman MQ-8 Fire Scout is an unmanned autonomous helicopter developed by Northrop Grumman for use by the United States Armed Forces. The Fire Scout is designed to provide reconnaissance, situational awareness, aerial fire support and precision targeting support for ground, air and sea forces. The initial RQ-8A version was based on the Schweizer 330, while the enhanced MQ-8B was derived from the Schweizer 333. 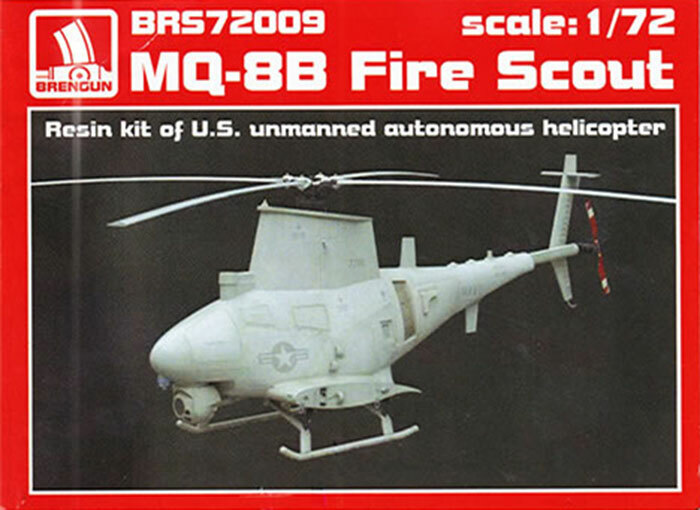 The larger MQ-8C Fire Scout variant is based on the Bell 407. As the US Navy was withdrawing its RQ-2 Pioneers from service, it began to seek a second generation UAV. The Navy requirement specified a vertical takeoff & landing (VTOL) aircraft, with a payload capacity of 90 kg (200 lb), a range of 125 miles (200 km), an endurance on station of three hours at an altitude of 20,000 feet (6,100 m), and the ability to land on a ship in a 46 km/h (29 mph) wind. The UAV was to fly 190 hours before planned maintenance. There were three finalists in the competition, which was designated "VTOL-UAV" or "VTUAV". Bell, Sikorsky, and a collaboration of Teledyne Ryan and Schweizer Aircraft submitted designs. The Ryan-Schweizer UAV was selected as the winner in the spring of 2000. The RQ-8A Fire Scout, as it was named, was a derivative of the Schweizer three-passenger, turbine powered 330SP helicopter, with a new fuselage, new fuel system, and UAV electronics and sensors. The initial prototype of the Fire Scout was piloted in initial tests, flying autonomously for the first time in January 2000. The Rolls-Royce 250-C20 turbine engine ran on JP-8 and JP-5 jet fuel (the latter of which has a higher flashpoint and is considered safe for shipboard storage and use). The Fire Scout was to be fitted with a sensor ball turret that carries electro-optic and infrared cameras, and a laser range finder. It was to be controlled over a data link derived from the Northrop Grumman RQ-4 Global Hawk UAV, operating over a line of sight to a distance of 172 miles (280 km). The control system was to be fitted onto a ship, or could be carried on a Humvee light vehicle for US Marine service. Although progress on the project had been regarded as satisfactory, the Navy decided the Fire Scout didn't meet their needs after all, and cut funding for production in December 2001. However, the development program continued, and Northrop Grumman pitched a range of improved configurations to anyone who was interested. As it turned out, the U.S. Army was very interested, awarding a contract for seven improved RQ-8B evaluation machines in late 2003. In 2006, it was redesignated MQ-8B. 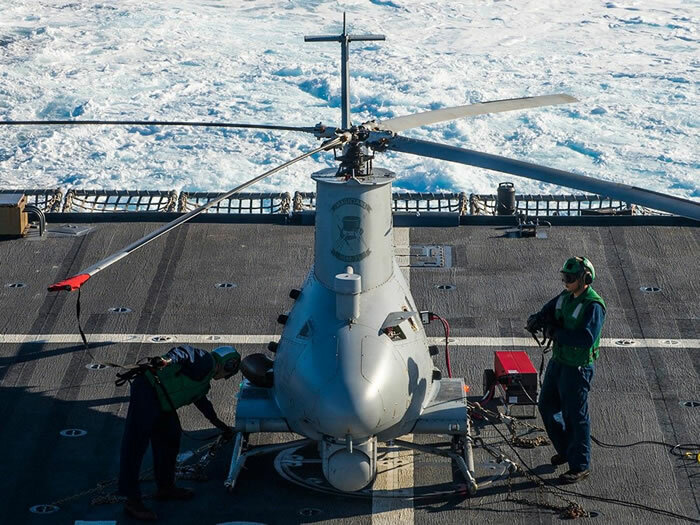 The MQ-8B features a four-blade main rotor, in contrast to the larger-diameter three-blade rotor of the RQ-8A, to reduce noise and improve lift capacity and performance. The four-blade rotor had already been evaluated on Fire Scout prototypes. They increase gross takeoff weight by 500 pounds (230 kg), to 3,150 pounds (1,430 kg) with payloads of up to 700 pounds (320 kg) for short-range missions. The MQ-8B is 23.95 feet (7.30 m) long, 6.2 feet (1.9 m) wide, and 9.71 feet (2.96 m) tall. The MQ-8B is fitted with stub wings which serve both an aerodynamic purpose as well as an armament carriage location. Weapons to be carried include Hellfire missiles, Viper Strike laser-guided glide weapons, and, in particular, pods carrying the Advanced Precision Kill Weapon System (APKWS), a laser-guided 70 mm (2.75 in) folding-fin rocket, which the Army saw as ideal for the modern battlefield. The Army was also interested in using the Fire Scout to carry up to 200 pounds (91 kg) of emergency supplies to troops in the field. The MQ-8B is being modified to permit rapid swap out of payload configurations. The current sensor configuration of a day/night turret with a laser target designator will remain an option. Alternate sensor payloads in consideration include a TSAR with Moving Target Indicator (MTI) capability, a multispectral sensor, a SIGINT module, the Target Acquisition Minefield Detection System (ASTAMIDS), and the Tactical Common Data Link (TCDL). The Army wanted the Fire Scout to operate as an element of an integrated ground sensor network as well. In April 2006, production on the flight test airframes was initiated at Northrop Grumman's Unmanned Systems production plant in Moss Point, Mississippi. The first flight of the MQ-8B took place on 18 December 2006 at Naval Air Station Patuxent River. The Army interest revived Navy interest in the program, with the Navy ordering eight Sea Scout MQ-8B derivatives for evaluation. In January 2010, the Army terminated its involvement with the Fire Scout, contending that the RQ-7 Shadow UAV could meet the Army's needs. In 2009, the Navy approved low-rate initial production. As of February 2018, 23 MQ-8B variants were in service with the U.S. Navy. Firstly the kit comes in small top opening box. Upon opening you are met with a bag of very nicely cast resin parts. 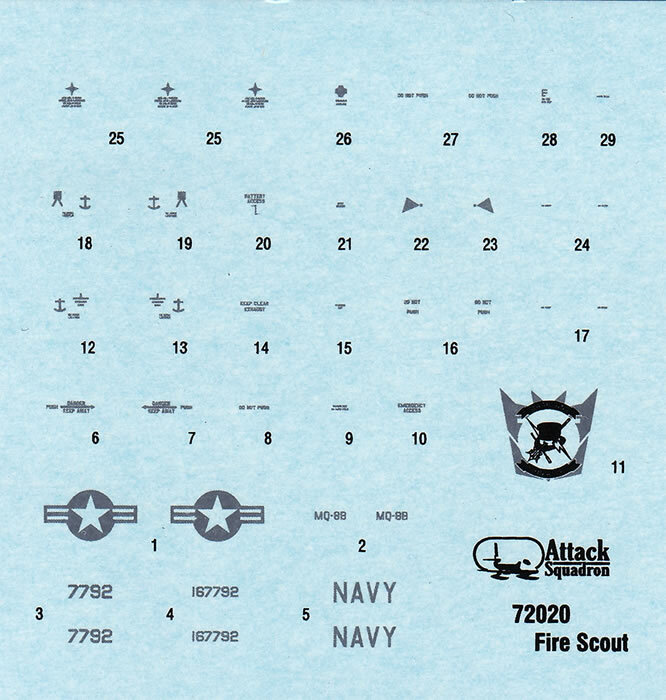 This kit is actually a re-issuing of the Attack Squadron kit by Brengun, originally released in 2012. Now for a detailed look at the kit. The first thing you notice is that you have a large piece of resin that is the major body part. Having made many choppers over the years I’m quite excited by this offering due to the fact that it does not have a canopy/clear nose as is the norm for helicopters, and if I’ve learnt something with all of these efforts, it’s that no matter how good the fit of the injected body parts are, the canopies tend to give you grief in every build I’ve done. The Fire Scout is a newer US Navy drone so…..no canopies….oh the joy of that. Construction is fairly simple with this large body section, with some nice detail beneath it as well, just the upper engine compartment, the nose section, a simple assembly for the tail and the skids. The bulk of the parts are actually intakes, avionics bumps and aerials that numerously cover the body. 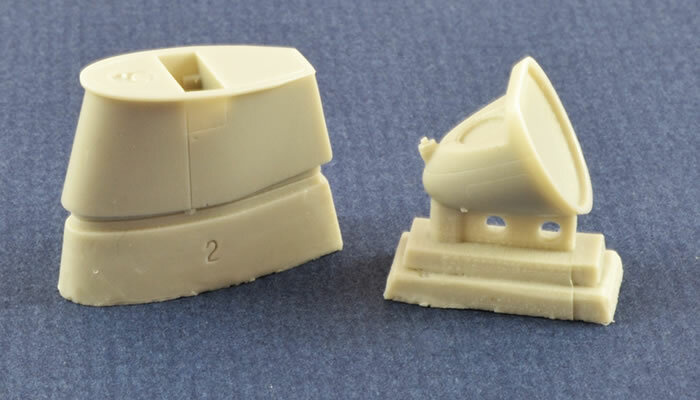 Two things here, firstly you will need great care in removing these from the casting blocks to stop the carpet monster being fed. Secondly, great care will be needed in the judicious application of CA glue to keep cleaning up to a minimum. The kit also comes with a small sheet…very small….of photo-etch brass. This has the tail rotor, several blade antennae and an engine intake cover. This sheet does not show in the parts layout on the instruction sheet which is a little confusing from Brengun. The next bit of confusion comes with the decals. 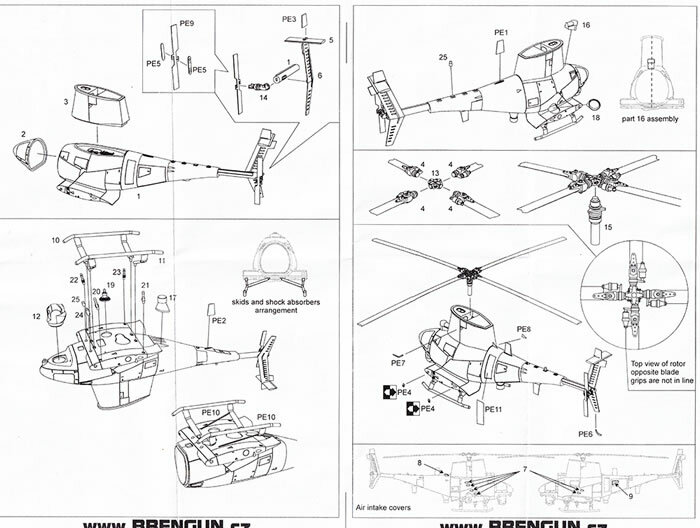 Brengun have given us detailed instructions, many stencil decals and the major decals for a much photographed airframe. They mention, on the back page, details of sets of bonus schemes on a separate decal sheet but no details or where to get details. I have spent some time searching, hoping to get at least some photographs of those airframes to help with decal placement. 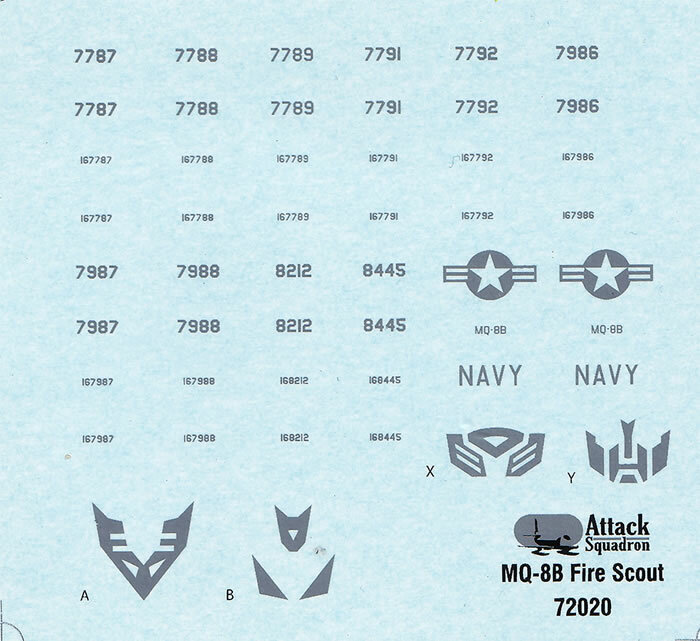 Interestingly, 2 of these schemes are for Transformer marked aircraft and a Decepticon one. I am at a loss as to why Brengun supply all these details and nothing to back up the use of them. Very disappointing Brengun! The decals themselves appear to be in good register and well printed. Despite the few negatives, which really are minor, I’ve mentioned, this is a very neat kit. 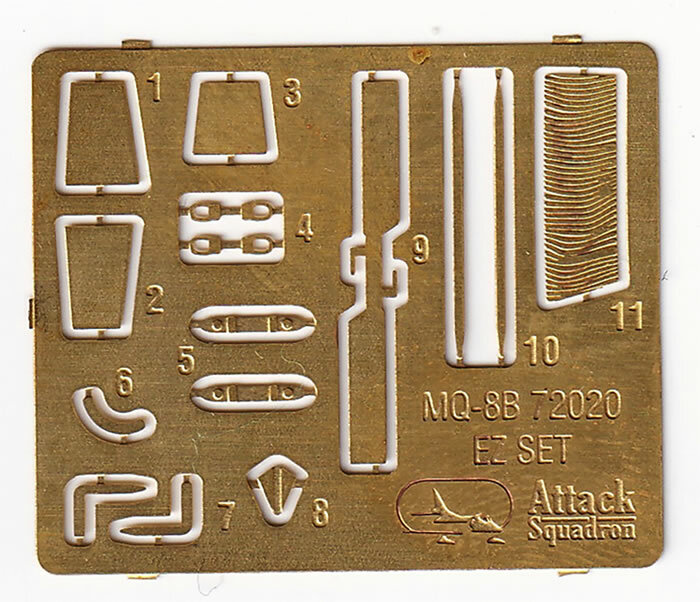 Currently I’m in chopper block territory fighting a Kitty Hawk Venom and a Fujimi Alouette III as a RAAF machine and this kit has excited me with the resin quality and the degree of “simplicity” and will make a nice addition to my collection. Watch this space as it’s now on the bench already and I’ll give a build review soon. It will be done as the documented scheme.